This blog was inspired by David McNeil poem ‘The Way Of Narcissus. I wanted to know more about the Greek mythology story and how this is very appropriate to many in todays society. 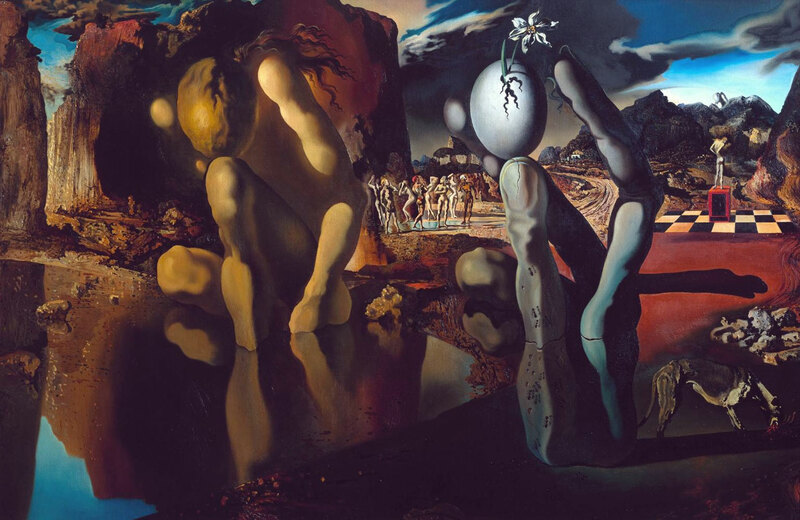 There are many versions of the Greek mythology story of Narcissus whose beauty, equal to that of a god, and was the cause of his downfall and equally many artisit took up this theme in the paintings. In the Roman Version of Eco, a nymph who could not speak first because he was punished by Juno, who had fallen madly in love with Narcissus. However, she could not declare herself because with her voice she could only echo that of Narcissus, who abruptly refused her. So the girl spent the rest of her life wandering through the valleys until she became just a voice. 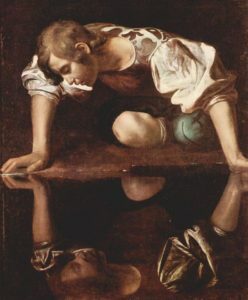 Narcissus was the son of Cepisous, a river divinity, and of Liriope, a nymph. As Narcissus grew up, Liriope became aware of her sons’ good looks, and both men and women would fall madly in love with him, and he would reject and shun everyone. 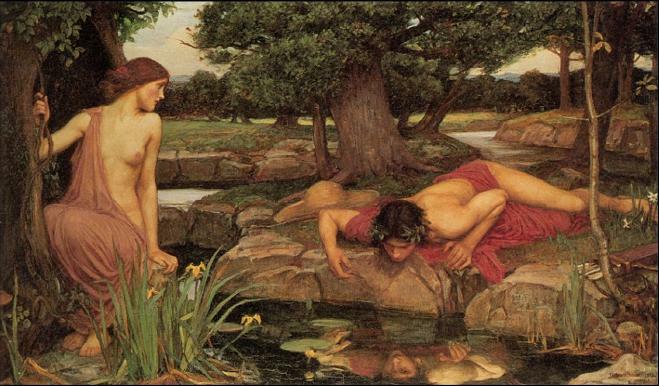 With this in mind, Liriope went to visit Tiresias oracle, who advised her never let Narcissus know himself. Tiresias, having listened to Liriope’s requests, said in a heavy tone “that her son would have a long life if he were not to know himself.” Liriope, who did not understand the prophet of the fortune-teller, left and with the passing of the years, she forgot what had been prophesied to her. Over the years Narcissus grew strong and had the looks of a most beautiful god. 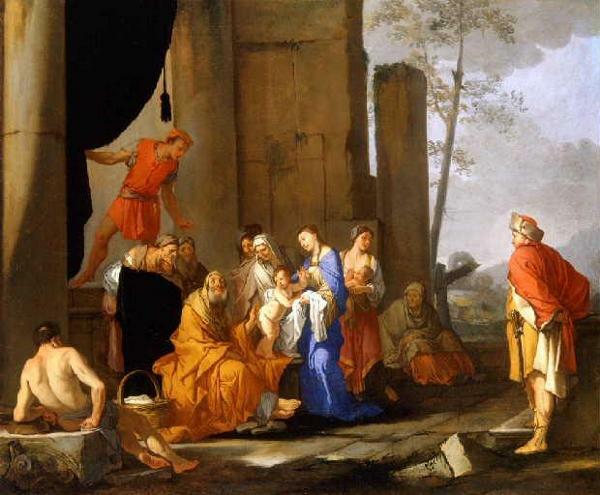 Both Men and women admired him and fell in love with him even if Narcissus shunned every loving attention and became insensitive to everyone’s feelings, even Aminius, a passionate lover of his, took up a sword and pierced his heart to demonstrate his love. The gods wanted to punish Narcissus for his coldness and insensitivity and sent Nemesis, goddess of revenge, who waited at a spring for Narcissus. 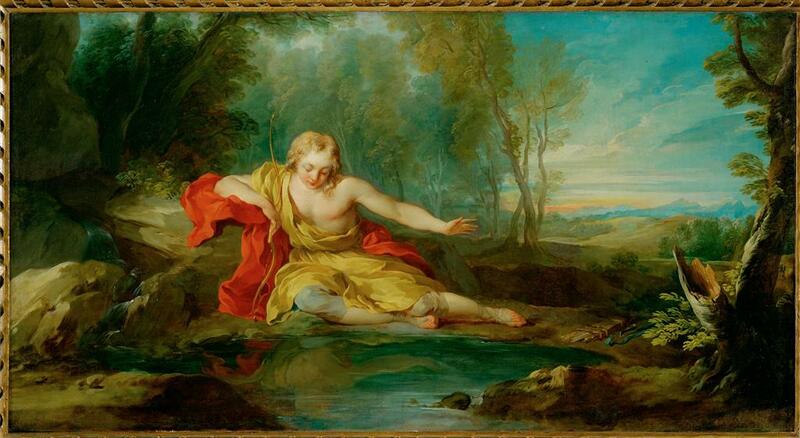 Narcissus bent down to drink water, and after seeing his image reflected he fell in love with himself. Not aware that he was facing himself, Narcissus sent kisses and tender caresses and plunged his arms into the water to touch that gentle face, but the image disappeared as soon as he reached for the reflection. Narcissus remained for a long time near the source trying to grasp that reflection without realizing that the days flowed inexorable, forgetting to eat and drink supported only by the thought that the evil spell that caused that image escaped him, disappear forever. Narcissus died, at the source that had given him love. 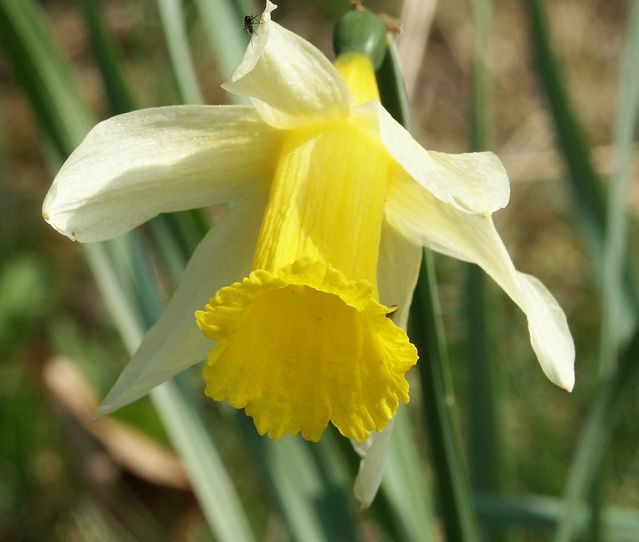 When the Naiads and the Dryads went to take his body to place it on the funeral pyre, it is said that in its place was found a beautiful flower that bore his name Narcissus or otherwise known as the daffodil. With Narcissus passing to another life, he crossing the Styx, the river of the dead to enter the Underworld, he continued to search for his beloved, reflected in the waters of the black river. In whatever way Narciso is dead, it is certain that this myth has survived to this day. Painters, musicians, writers, psychologists, continue to draw inspiration from the story of this young man. Was he self-centered? Was he selfish? Was he naive? Everyone gives the interpretation that it considers most appropriate even if it is certain that after all the young Narcissus was looking for only one thing: love and that love was himself. 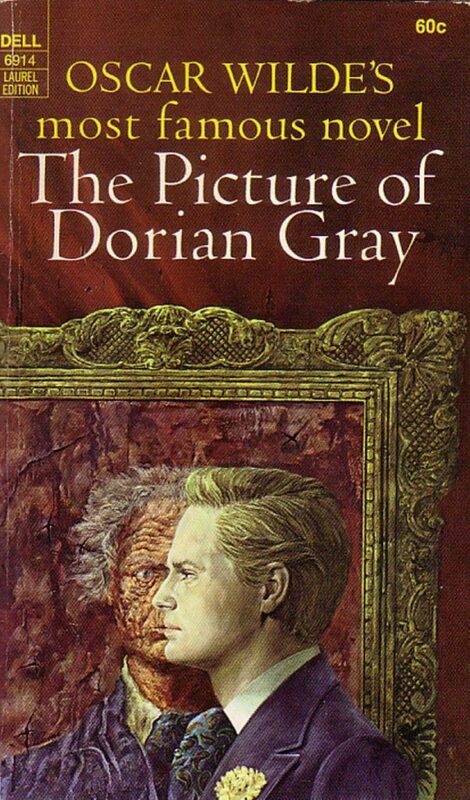 When I read the book “The Picture of Dorian Gray” (1891) by Oscar Wilde you can see some of the characteristics of the Narcissus stories poking through, even Oscar Wilde said that in the story three of the characters were reflections of himself. To fully understand the celebrity of the myth, we can see that the words narcissism and narcissism have now entered our everyday vocabulary to indicate a person who feels too much love for himself. This helps us to understand how the Greek myths are now part of our cultural heritage and how much they have influenced our civilization since the beginning.